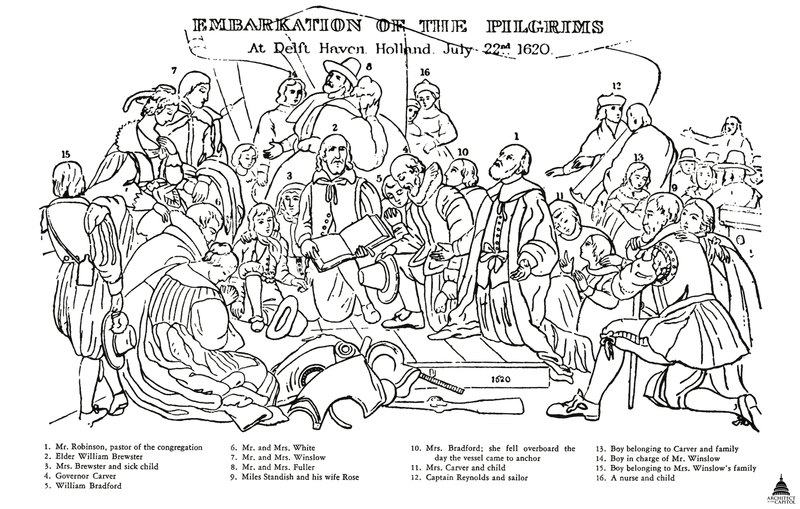 This painting depicts the Pilgrims on the deck of the ship Speedwell on July 22, 1620, before they departed from Delfs Haven, Holland, for North America, where they sought religious freedom. They first sailed to Southampton, England, to join the Mayflower, which was also making the voyage. After leaks forced the Speedwell to make additional stops in Dartmouth and then Plymouth, its passengers boarded the Mayflower. Five months later the Pilgrims settled the Plymouth Colony in present-day Massachusetts. The group appears solemn and contemplative of what they are about to undertake as they pray for divine protection through their voyage; the words "God with us" appear on the sail in the upper left corner. The figures at the center of the composition are William Brewster, holding the Bible; Governor Carver, kneeling with head bowed and hat in hand; and pastor John Robinson, with extended arms, looking Heavenward. Gathered around them are the men, women, and children going on the voyage. Some are dressed in traditional puritan attire while others wear more fanciful and bright garments. The armor, helmet, and musket in the foreground represent the tools that the Pilgrims will use for protection in the new and unfamiliar land. In the background on the right are the city and people the Pilgrims leave, and on the left a rainbow represents the hope and promise of what lies ahead. Embarkation of the Pilgrims is Robert Weir's most famous work. Initially, Weir had intended to paint a scene depicting the Mayflower Compact. However, the same subject was proposed by artist and inventor Samuel F. B. Morse, who also sought a commission for one the Rotunda paintings. While Morse did not receive a commission, Weir out of respect chose instead to the paint the embarkation from Delfts Haven. Weir's depiction of the event was drawn from Nathaniel Morton's New-England's Memorial of 1669 and, perhaps, Cotton Mather's Magnalia Christi Americana. The armor and costumes Weir collected in Europe were sources for the garments worn by those depicted. The painting was completed in July 1843 and was first seen by the Corps of Cadets at the United States Military Academy at West Point, where Weir was an instructor. The painting then traveled to Boston, New York, and Philadelphia and was hung in the U.S. Capitol in December that same year. The painting has undergone various cleaning, repair, and restoration treatments. In November 1860, the painting was damaged by a falling beam during the construction of the new dome, scraping the painting and causing a hole near the foot of Miles Standish. The War Department detailed Weir from West Point to make the needed repairs. The painting has since undergone periodic cleaning and restoration, including relining and varnishing, with the most recent cleaning in 2008. In 1857, Weir painted a smaller version of Embarkation of the Pilgrims, which is now in the Brooklyn Museum of Art. In the later work, Weir made changes in light and details and achieved greater focus on the three central figures by giving them fuller faces and broader shoulders. Engravings of this later painting have appeared on the reverses of several U. S. currency notes, including a $50 bank note and the $10,000 Federal Reserve note, the largest denomination ever issued to the general public. Robert Walter Weir was born in New York City on June 18, 1803. He was a largely self-taught artist who had some formal instruction but developed his skills through first copying pictures and later traveling to Europe to study the art of Florence and Rome. He spent much of his career as an instructor at the United States Military Academy at West Point, where he was appointed Instructor of Drawing in 1834 and promoted to Professor in 1846; after forty-two years at the Academy, he retired in 1876 and set up a studio in New York City. He painted and exhibited portraits, landscapes, and genre scenes throughout his life—for example, Portrait of Walter Weir (1853), View of the Hudson River (1864), and The Greenwich Boat Club (1833). Weir married Louisa Ferguson in 1829 and later, after her death, married Susan Martha Bayard. He was the father of sixteen children, including artists John Ferguson Weir and Julian Alden Weir. Robert Weir died on May 1, 1889, and is buried at West Point.